A degree in catering provides graduates with the skills necessary to market, plan and run catering food service companies and operations including restaurants. There are many inherent risks associated with opening a restaurant. One of the risks is the cost of wasted food. Many novice restaurant owners end up failing to break even because they offer a menu that is to broad for their potential customer base, requiring them to keep a lot of food in stock that potentially never gets used. Other pitfall to opening a restaurant is building a reputation for quality. Many restaurant owners just can't get the word out about their establishments until their money runs out. Many people who aspire to open a restaurant have avoided these problems by first establishing a catering business. Catering is much less risky than opening a restaurant, because you make enough food for the party hiring your services, and you can build a reputation for yourself as a cook without having the overhead associated with a restaurant. 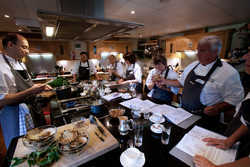 There are a number of catering schools where you can be trained on how to start your own catering business. These training programs are often a blend between cooking school and more practical business skills needed for anyone starting their own business. Once properly trained, you can cast your net among friends or family, and potentially do a bit of advertising, and start building your business party by party. If your food is good, then people will come back and also tell their friends. This is how all good businesses grow.